As I begin my job search (25 applications in 2 days so far!) I keep asking myself how to describe what I’m looking for in a job and in what realm do I wish to work? There is no specific job title that describes my experience and education (e.g. “doctor” or “software engineer”) and there is no one department in which I’ve worked or wish to work (e.g. “Operations” or “Logistics” ). Yes, I have an academic background in mathematics & statistics yet it’s difficult to communicate why I have that academic background. I do not necessarily want to become a statistician but rather I fully understand the quantitative nature of things and the power that numbers, math, and quantitative methods have in all aspects of business, government, and life. So where does this leave me? Well, unemployed and confused, for one. But that’s okay with me. I’m confident that with my capabilities, no matter how hard they may be to communicate in an application or even to a recruiter, I’ll find the position that leverages my abilities and motivation. That being said, I think I’m at least getting close to describing where I stand, and in real-world terms. It’s at an intersection of sorts – between quantitative methods, scientific and technological realms, and the human element. 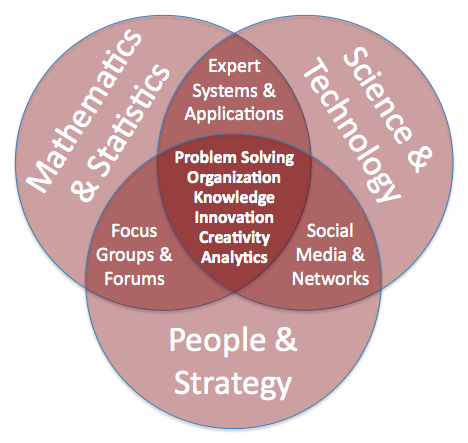 It’s interdisciplinary – can fit within any group or team or stand alone as an independent researcher or consultant. It’s also dynamic – parallels the speed with which modern business operates and the flexibility required to optimally support the needs and requirements of many types of personnel. At what intersection do you operate?